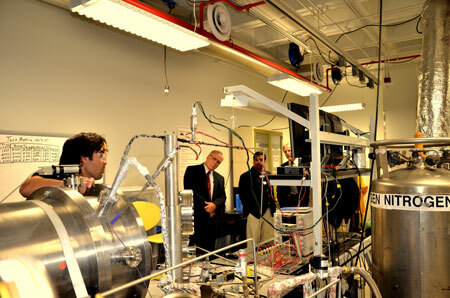 Archive photo of a prior DOE visit to the mechanical engineering labs. From left to right: Abraham Trujillo, former graduate student in mechanical engineering (now employed at Blue Origin); Regis Conrad, director of the Division of Crosscutting Research at the U.S. Department of Energy’s Office of Fossil Energy; Ahsan Choudhuri, Ph.D., chair of UTEP’s Department of Mechanical Engineering; and Robert R. Romanosky, Ph.D., technology manager for Crosscutting Research and Analysis at the U.S. Department of Energy’s National Energy Technology Laboratory. Choudhuri and Associate Professor Norman Love, Ph.D., will collaborate with industry partner Airliquide to demonstrate oxy-combustion technologies. Pressurized oxy-combustion-based electric power generation systems have the potential to improve efficiency while achieving more than 90 percent of carbon dioxide capture. The total project cost is about $1.5 million, which includes $1.1 million from the DOE’s Advanced Combustion Systems Program. The project will be housed at UTEP’s new Technology Research and Innovation Acceleration Park in Fabens, Texas.